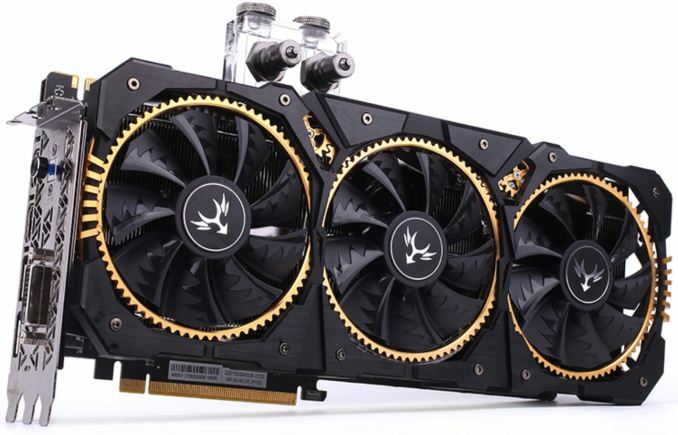 Colorful has started to sell its highest-performing video card to date, the iGame GeForce GTX 1080 Ti Kudan. The graphics adapter features a large three-wide hybrid cooling system with four fans in total and the manufacturer guarantees that the GPU will hit nearly 1.8 GHz in boost mode once a factory overclocked setting is activated. The Colorful iGame GeForce GTX 1080 Ti Kudan is the company’s flagship card based on NVIDIA’s GP102 GPU and thus is the highest-performing one in its product lineup. The graphics adapter is based on a custom PCB with an advanced VRM to ensure sufficient amount of “clean” power delivered to the GPU and memory that are supposed to work at frequencies beyond their nominal. Colorful says that the VRM uses its IPP (iGame Pure-Power Inductance) feature and silver-plated elements to reduce electric resistance, but does not elaborate. Out of the box, the iGame GeForce GTX 1080 Ti Kudan comes with NVIDIA’s reference clock rates, but once a switch on its bracket is toggled, the card loads “Turbo” BIOS mode and sets GPU frequencies to 1657 MHz/1784 MHz (base/boost), among the highest factory-overclock settings for the GP102 in the industry. In fact, at nearly 1.8 GHz, the GPU on the GTX 1080 Ti Kudan card produces more TFLOPS than the GPU on NVIDIA’s Titan Xp (it does not mean that Colorful’s card will be faster than the Titan Xp in all cases though). 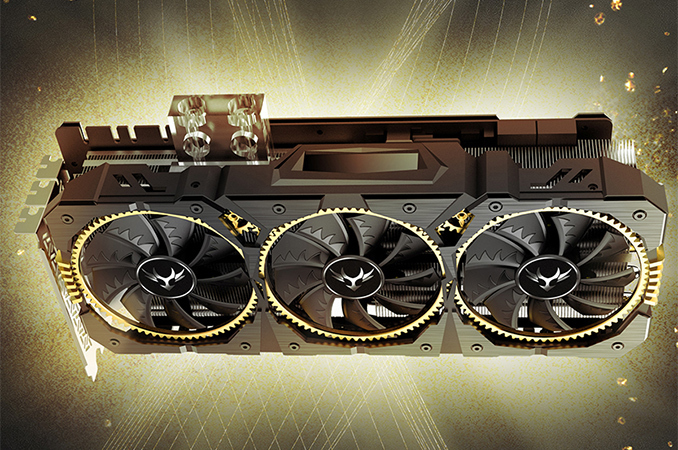 To guarantee that the graphics adapter can work at its frequencies reliably and to provide a further overclocking headroom, the iGame GeForce GTX 1080 Ti Kudan is equipped with a rather unique hybrid cooling system. 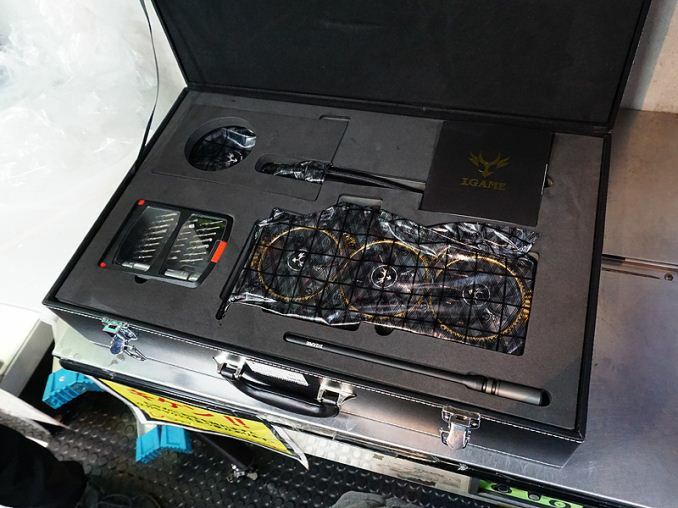 The cooler on the card is comprised of a large heatsink featuring heatpipes, an integrated waterblock for the GPU, a connectivity hub for liquid cooling and is outfitted with three 92-mm fans. 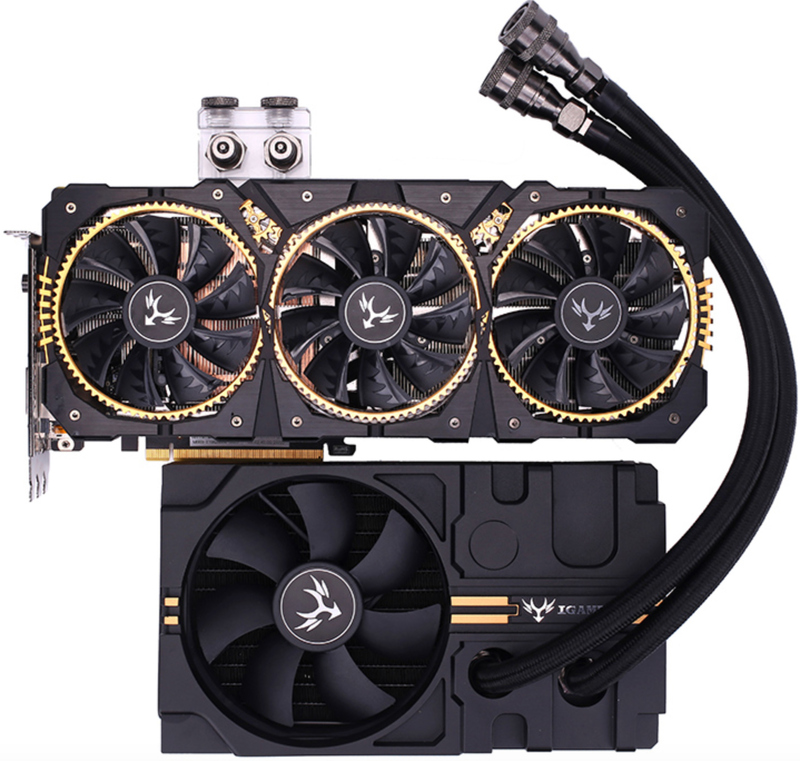 The pre-installed three-wide cooler is enough to run the video card even in overclocked mode, but those who want to hit even higher frequencies can connect a 120-mm radiator with water pump and enjoy the benefits of liquid cooling. Since the heatsink on the card is rather large, it likely cools down not only the GPU and memory, but also the cards’ multi-phase VRM, which gets very hot on contempoerary graphics cards. This is a major advantage of the iGame GeForce GTX 1080 Ti Kudan over the iGame GeForce GTX 1080 Ti Neptune W, which cools its GPU using liquid, but which VRM is only cooled down passively using cold plates. Unlike EVGA with its GeForce GTX 1080 Ti K|NGP|N Edition (KPE), Colorful does not give any guarantees when it comes to GPU overclocking, but the cooling system used by the GTX 1080 Ti Kudan gives a feeling of confidence that the card can run at higher frequencies than those set by the manufacturer for its “Turbo” mode. To monitor the card without any software utilities, the iGame GeForce GTX 1080 Ti Kudan is equipped with a special LCD on top that displays clocks, temperature and fan speed. As for connectivity, the card has two DisplayPort 1.4 headers, two HDMI 2.0b ports, and a DL DVI-D output. The board requires two 8-pin auxiliary GPU power connectors due to ensure overclocking potential and stability. Kudan is the ninth-degree black belt in Japanese martial arts, the second highest rank after Judan (tenth-degree dan, the absolute top in modern martial arts). Only fifteen people in the worlds were ever promoted to Judan in Japan and there are only three living 10th dan holders, so Colorful did not use the word to brand its mass market product. Instead, it used Kudan, which represents a rare top-grade master in martial arts that stands well above 99% of black belt holders. Indeed, the iGame GeForce GTX 1080 Ti Kudan is designed to outperform all the other GP102-based adapters on the market and for this reason is pretty heavily armed when it comes to cooling. Due to dimensions, the GTX 1080 Ti Kudan will not fit into all desktops, which somewhat further proves its unique positioning and purpose. 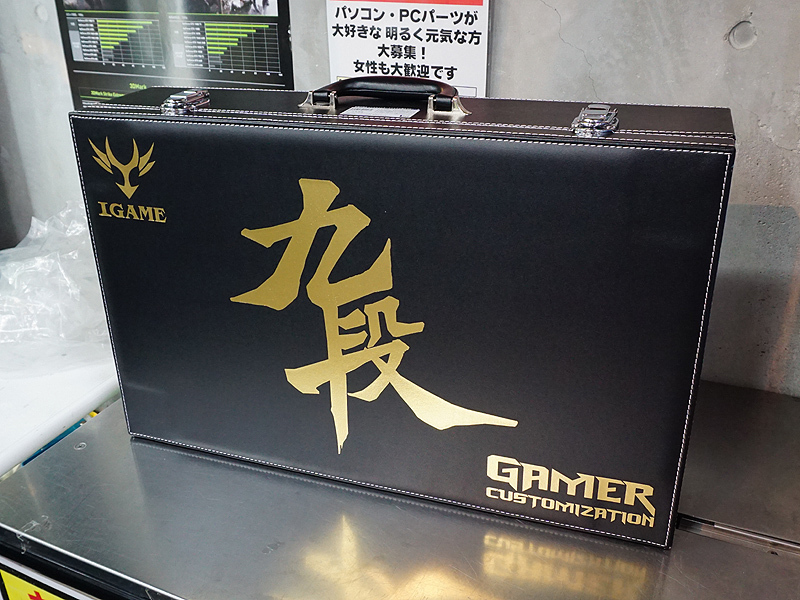 The Colorful iGame GeForce GTX 1080 Ti Kudan is now available in select stores in Japan for ¥158,890 (or $1399). Graphics cards traditionally carry a high premium in Japan, so the high price of the new unit is not surprising. Colorful graphics cards are not officially available in the USA, so it is unclear how much the iGame GeForce GTX 1080 Ti Kudan might cost on this side of the Pacific Ocean, but virtually all grey market imports are very expensive. But if it's faster than the titan xp when overclocked couldn't I just oc my titan xp by the same amount and regain the lead? Love the way this card looks.